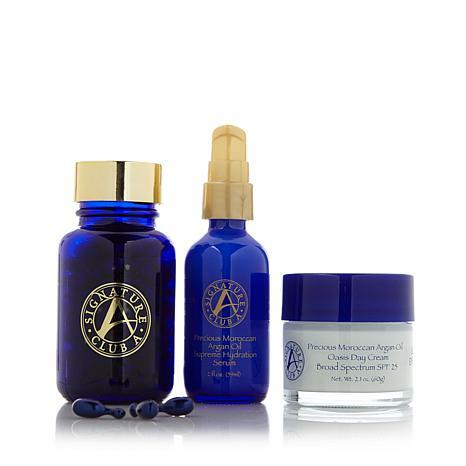 Take your skincare to-go with this super sized trio of mega moisturizing argan skin care products. Creams, serums and capsules come together in a super size pack of three to bring your skin the best in nourishing hydration. Keep out of reach of children; if product is swallowed, get medical help or contact a poison control center right away. 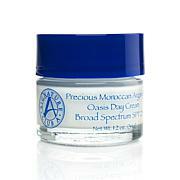 Apply liberally 15 minutes before sun exposure and reapply at least every 2 hours. Ask a doctor before using on children under 6 months old. Formulated with botanicals used in Ayurveda, an ancient Indian tradition that means "science of life"
Ingredients: Isopropyl Myristate, Cyclomethicone, Squalane, Argania Spinosa Kernel Oil, Adansonia Digitata Seed Oil, Polysorbate 20, Myrothamnus Flabellifolia Extract, Tamarindus Indica Seed Polysaccharide, Carthamus Tinctorius (Safflower) Seed Oil, Anastatica Hierochuntica Extract, Trehalose, Tocopheryl Acetate, Glycerin, Water, Fragrance, Phenoxyethanol. Ingredients: Water / Cyclomethicone / Dimethicone / Coconut Alkanes / Glycerin / Caprylic/Capric Triglyceride / Butylene Glycol / Polymethylsilsesquioxane / PEG-10 Dimethicone / HDI/Trimethylol Hexllactone Crosspolymer / Polysilicone 11 / Hydrolyzed Adansonia Digitata Extract / Argania Spinosa Kernel Oil / Hydrolyzed Caesalpinia Spinosa Gum / Caesalpinia Spinosa Gum / Sodium Hyaluronate / Ethylhexyl Palmitate / Silica Dimethyl Silylate / Sodium Chloride / PEG/PPG-18/8 Dimethicone / Isopropyl Titanium Triisostearate / Disteardimonium Hectorite / Phenoxyethanol / Ethylhexylglycerin / May Contain: Mica / Titanium Dioxide / Iron Oxides. Ingredients: Caprylic/Capric Triglyceride, Ricinus Communis (Castor) Seed Oil, Ethylhexyl Palmitate, Beeswax, Hydrogenated Microcrystalline Wax, BHT, Synthetic Wax, Paraffin, Glycol Montanate, Bis-Diglyceryl Polyacyladipate-2, Phenoxyethanol, Ethylhexylglycerin, Fragrance, Argania Spinosa Kernel Oil, Tocopheryl Acetate, Adansonia Digitata Seed Oil, May Contain: Red 7 Lake, Red 6 Lake, Iron Oxides, Titanium Dioxides. Love when she keeps current on new ingredients to put in products. 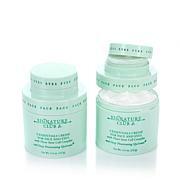 I started using Signature Club A skin line about 15 years ago. 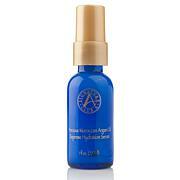 At that time I did not find too much difference between Argan oil line and the others. Now I am in my early 60's all of a sudden I noticed my skin became thinner and I am having crawl feet and bagging eyes. With the rich absorbing ability of Argan oil my face is alive. Nobody believes I am in my 60's. People thought I am in my early 50's. Will continue using it. These two wonderful oils give super softness to your skin both day and night. I actually can't wait to use them, you feel you are really pampering yourself. I love the feeling this gives my skin. I will be buy more ..